Cruisin' The Coast organizers have had no problems dreaming big. The annual event set yet another record Tuesday with 6,234 vehicle registrations, eclipsing last year's mark of 6,169. Cruisin' The Coast registration director Lisa Burnett said numbers continue to rise and are expected to do so until Saturday's cutoff. Attendees have traveled from 40 states and Canada -- "one of these years we're going to get all 50," Burnett said -- with most vehicles hailing from the 1950s and 60s. Tropical Storm Karen had a minimal impact on Cruisin' as the potential hurricane left the region with more of a whimper. Burnett said some folks pushed back their arrival by a day, but that was about the extent of Karen's impact on the event. Word of mouth has been Cruisin's best vehicle for advertising, Burnett said. "It's been going up every year," she said. "Our best advertisement is word of mouth. People will call us saying they were in Tennessee at this show or Florida at a show and everybody was talking about Cruisin' The Coast and if you haven't been there that's where you need to go." Burnett said Cruisin' separates itself from other events in a number of ways, which has allowed it to grow over the years. "Part of the attraction is we are a driving event so they get to drive their cars," she said. "It's all along the beach front and we get to see some beautiful scenery. One thing that keeps popping up is the friendliness of the people and the Southern hospitality they encounter here at the venues, restaurants and hotels. Anybody they encounter are just so nice to them and they feel welcome here. "I had one gentleman tell me it's like eight days of being 18 again." 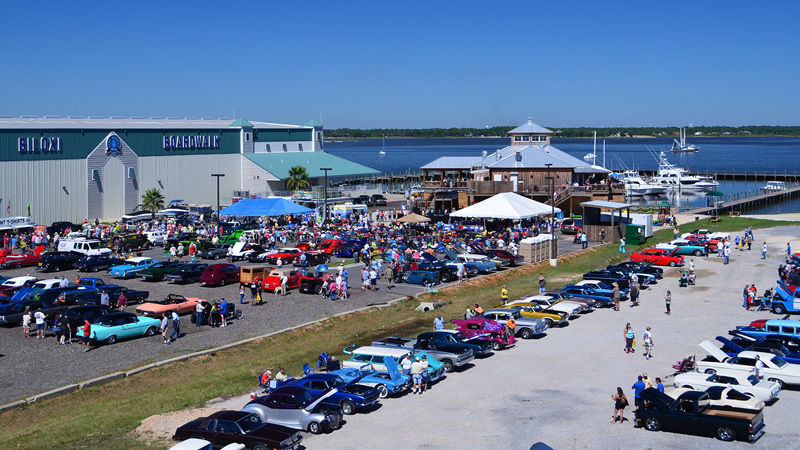 Cruisin' The Coast organizers already are turning their attention to 2014 with pre-registration starting today at noon and running through Sunday. "We're gluttons for punishment," Burnett laughed.